Posted on December 5th, 2017. 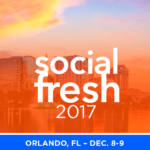 We’re excited to announce that we are partnering with Social Fresh Conference 2017. This will be the 20th conference produced by Social Fresh since 2008. Over 250 of the Fortune 500 have attended their events. Posted on March 4th, 2015.